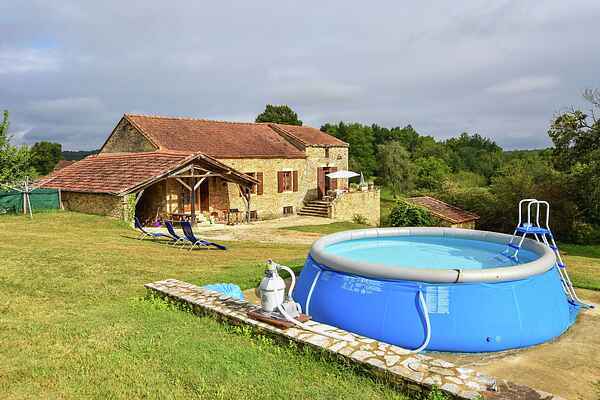 This villa in the area of Villefrance-du-Perigord has a gorgeous locations, in the middle of a lovely wooded area in the Perigord. The large southwesterly facing garden offers lots of room to suntan and for the kids to play. Football, jeu-de-boules, building sandcastles in the sandbox, they have lots of choices. Afterwards, they can cool down In the above ground pool. The interior of the vacation home is tidy. The antique sofa bed is there pure for decoration and the stone wash basin is yet another nice detail. The bastide town of Villefranche-du-Perigord dates back to the thirteenth century. The magnificent covered market hall is still being used for the trade in chestnuts and mushrooms. Bresse (8km), as pretty, houses a little church from the twelfth century, of which the roof is original. A short car ride gets you to another one of the jewels in the area, such as Monpazier (19 km), with the beautiful arcade square. A visit to the caves of Les Eyzies-de-Tayak-Sireuil (Grotte du Grand Roc (stalactite cave)( 47 km), is an adventure, also the Grotte de Font de Gaume (45 km). The latter is famous for its prehistoric rock paintings. A visit to Cahors (45 km) also makes for a nice daytrip.